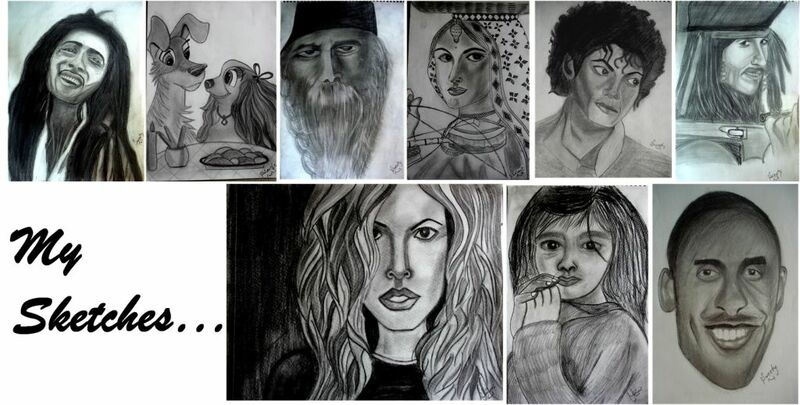 My Sketches: Beginning of Sketching! Drawing, Sketching, Painting - they have always been on my list of things for which I am super passionate about! Why? Here is one simple reason - pursuing them gives me a very small yet hard to find thing and that is satisfaction! I feel so contented and satisfied when I see a piece of my thought drawn on a paper with so much hard work! Can’t tell you how amazing that feeling is! It works like magic. It just takes away all your stress, your worries, your pain! Believe me! I learnt painting in 10th std. I made three paintings back then and really wanted to go for the 4th one because I wanted to pursue this one thing forever! But then, as usual the burden of studies, career etc didn’t allow me to do that. And gradually I gave up this hobby of mine! Then one day, few weeks ago, I was thinking about life, what to do next (I do that more often and my mind hates me for that!!!). I had this desire of doing something new, something for myself, something I love to do, something that gives me immense happiness, satisfaction and pleasure, something that I can cherish for life! And even, something that could help me to get rid of the stupid tensions and stress of life!!! God, I tell you however happy you are in life, these things never leave you! They are bacterias and virus which just gets inhaled with the first breath you take on this earth and then they just gets accumulated like rust inside your mind (forever!). And as it is so difficult to remove rust from a piece of iron, it is also hard to remove this rust from your head! If left unattended, this rust keeps on growing and gradually becomes the cause of much bigger worries, pains, and problems! So, when we know about all this, why don’t we just try to get rid of stress? I agree it’s not that easy as it sounds! If it would have been so then, everybody would have been roaming around happily but it is so difficult to find happy faces these days, all we see around us are the gloomy worried faces! But then atleast we should try! I have seen people who knows that they are getting rotten from inside from tension and stress still they just dont try to get rid of them! Anyways, even my life is no different! Even I own few tensions and stress. But then after dealing with them for so long, I decided to take out a way of atleast diverting my mind from them. And finally I decided to revive my hobbies! I decided to learn everything I wanted to learn in my life ever! So, sketching is the first thing I took up from my long, never ending list! Because when I think about the things I used to love doing in my childhood, drawing and sketching comes at the top. So, I thought why not to start with them, what’s wrong in living up my childhood again! And yes, saying this I can never forget to thank my mom in law first and then my husband who really helped me in taking up my hobbies again! The day I told my mom in law, she herself bought me pencils, sketch book, eraser, sharpener and all the paraphernalia required for Drawing! I love her. Would also like to mention one thing here that taking up this new assignment has definitely helped me in diverting my mind from day to day tensions, stress! I feel much happier, relieved and contended these days! So, find out a thing you always wanted to do! And then, go and start doing them without a single thought! You will start loving your life… And yes, its never late to start doing what you always loved doing!